At play and at work: NBC5's Scott Gordon rides again. 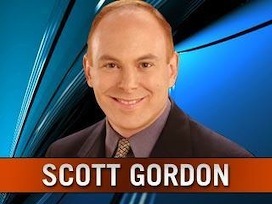 NBC5's Scott Gordon has been on quite a tear lately. On Valentine's Day, the veteran night ranger led the Peacock's 10 p.m. newscast with a live dispatch on the peanut butter recall by Peter Pan and Great Value. NBC's Today show ran with it the next morning, using footage from Gordon's report. It became a big national story. Now Gordon's got another biggie -- video confiscated by Watauga police of two-and-five-year-old pot smokers being taught to inhale by their laughing 17-year-old uncle and an 18-year-old friend. NBC5 anchor Jane McGarry called it "sickening" at the top of Friday's 10 p.m. newscast. Today then featured it prominently on Monday's program. When Gordon asked the since-jailed uncle how he could do such a thing, "he responded with expletives we can't put on TV," Gordon told viewers. He had video of that, too -- expletives deleted. Via email Monday, Gordon explained how he nailed down another nationwide tongue-wagger. "I had dealt with the Watauga police chief on previous stories," he said. "And when he told me about the video, I couldn't believe it. When I went to his office to look at it, my mouth dropped. It was one of those videos that is so shocking, I knew right away it would become a national story. "Today I hear from Child Protective Services that the kids are doing well in foster care and that doctors don't expect t hem to have any long-term health damage. Still, it can't be good for kids that age to smoke a cigarette, let alone a marijuana cigar." In an email exchange last month, Gordon detailed how NBC5 broke the salmonella-laced peanut butter story. "Through our reporting, we learned directly from ConAgra (makers of the two brands) shortly before news time that they had decided to issue a massive recall," Gordon said. "We reported it well before it hit the wires or, so far as we know, any other news outlet . . .Everyone else in the country followed up on it. In my opinion, this was a valid 'Health Alert,' an important story that directly affected many thousands of our viewers, and could have prevented people from getting very sick. "